Say goodbye to muddy paddocks, and say hello to healthy hooves. Traditionally spring and fall in your horse paddock means one thing: mud, and puddles, and hoof trouble. 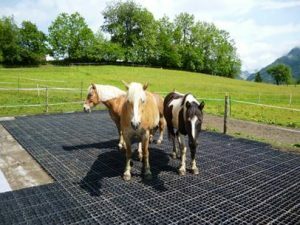 Not any more, Eco Raster permeable ground grid solutions are the number one free draining base system for indoor and outdoor arenas, paddocks, feed areas, and high traffic areas such as gates and barn areas. Instead of boot-sucking, and hoof wetting mud, Ecoraster provides a simple, quick to install surface that stays rut-free. 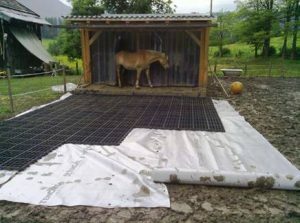 Ecoraster keeps your horses clean and dry, prevents “pawing” holes, and protects hay from sand and dirt to significantly lower the chance of contamination. There is no ground preparation here, therefore it is easy, fast, and DIY suitable. No need to hire contractors! Sub base slope needs to be 1.5-4% % to prevent puddling, but usually such areas already have enough of a natural slope. Please note that the horses can be on it before filling. The fill is with P-Gravel or chipped stone. This does not need top-filling, but if the you wish to have it then it should be with washed coarse sand. 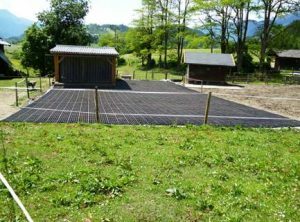 Ecoraster is fast and easy to install, and an inexpensive solution for mud which is the enemy of animal health and welfare. 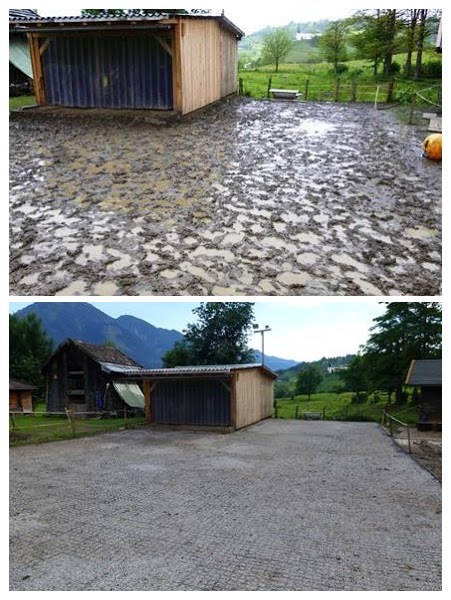 It can be permanent or temporary, easy to remove and re-locate if you have your horses in different paddocks. It’s all weather suitable and good for heavy equipment. And finally it saves a huge amount of muck-out time and work, so you can spend more of your time enjoying your horses, and less time cleaning up.